The generation that grew up in the 1950s and 1960s had its worldview formed by Top 40 radio. Disc jockeys with oversized personalities did wild stunts and played the music that came to be indelibly identified with that time. In Denver, it was KIMN, located at 950 on the AM radio dial, that captured the hearts of teens. In any town within listening range, kids and KIMN went together. The station was always there—on the little transistor radios that teenagers carried with them to school, on the car radio, on the speakers in the teen boutique sections of department stores.In the 1960s, under the ownership of Ken Palmer, KIMN became the dominant Top 40 music station in Denver. The station had other nicknames—the Denver Tiger, Boss Radio, and 95 Fabulous KIMN. KIMN’s famous cinder-block studio was located on 20th Avenue in Edgewater, just west of Sloan’s Lake. There was a special intimacy between the man on the radio and the kid listening in. If you called in to vote for a favorite song—and managed to get through all the busy signals—you would squeal at the thrill of actually talking to a real, outrageous, quicksilver tongued AM disc jockey.It was an earlier era of a more innocent brand of shock radio—and the famed Pogo Poge was king. The famous stunts he masterminded at KIMN are the stuff of legend. Poge would do almost anything to get people to listen to KIMN radio. He derived his name from the publicity stunt that announced his arrival at KIMN: He hopped into town on a pogo stick. He wore a racoon coat and a beatnik’s beard, and he drove a three-wheel car. He once set a world record for sitting on a Ferris wheel. Another time, he sat atop a flagpole at a South Broadway used-car lot for days. He broadcast while sitting on a giant block of ice, and once played the Kingston Trio’s “Tom Dooley” for 18 hours straight.Poge also emceed gigantic “sock hops” at Mammoth Gardens, and every Friday night, he broadcast live from the swimming pool at Celebrity Sports Center. One night, showing off for teen songstress Annette Funicello, he plunged into the shallow end of the pool, broke both elbows, and finished his show with both arms wrapped in towels. He spent 13-and-a-half days in a snake pit on 16th Street at the dug-out site of a Zale’s Jewelry store, where more than 100,000 people came to see him shut in with more than 100 snakes. The stunt put him in the hospital when his camp stool collapsed beneath him, he fell backward, and a water moccasin bit him three times on the arm.Owners notoriously hired big name disc jockeys away from competitors, and these record spinners built KIMN into a power. During the prime of his career, Jay Mack led the pack of popular KIMN jocks with his cast of crazy characters including Niles Lischness, Farley McCloot and Betty Jo Biolosky. Hal “Baby” Moore witnessed KIMN’s mid-’60s glory days and was consistently voted Denver’s top jock in the Harmony Record Shop poll. Danny Davis was brought to Denver as a headliner jock by KIMN in 1968, the year KIMN was named Station of the Year by Billboard Magazine. Roy Gunderson was known as Roy the Bell Boy, “the Ding Dong Daddy of Denver.” Anyone of a certain age can mention their favorites—people like Royce Johnson, Boogie Bell, Robert E Lee, Bill Holley “the Night Creature,” and Chuck Buell.Listeners participated in contests, which included jocks broadcasting live—in bed—from a dream house in Denver’s new Broomfield Heights suburb. 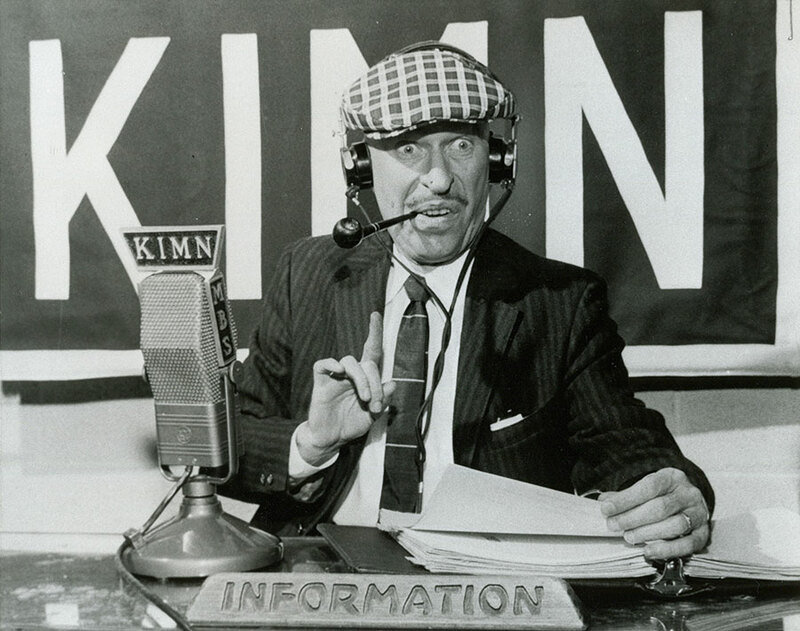 The house went to the listener who guessed most closely the number of continuous hours the jocks could broadcast without sleep.KIMN also created a news department that was second to none in Denver and allowed all family members to listen. It featured the “sky spy” traffic-reporting plane, only the fifth such plane in the country. “Sky Spy” Don Martin began flying above Denver’s rush-hour skies for KIMN in 1960, when there was hardly enough traffic to worry about and Interstate 25 extended only from Broadway to Interstate 70, which he famously named “the Mousetrap.” And when there weren’t enough traffic snarls, Martin would talk about the weather, or recite an occasional editorial. All six of KIMN’s mobile units covered the Beatles’ arrival at Stapleton Airport to play Red Rocks on August 26, 1964. Newspapers reported that at Stapleton, the entrance of the Brown Palace Hotel, the Red Rocks parking lots—anywhere a crowd gathered waiting for the big event—all the transistor radios could be heard tuned to KIMN.During its heyday, KIMN also highlighted the popular local rock ‘n’ roll bands such as the Moonrakers, the Astronauts, the Soul Survivors, the Fogcutters and Boenzee Cryque. Indeed, the station helped make local stars out of acts like Gary Stites, Ronnie Kae, Denny & Jay, the Action Brass and others. It also sponsored concerts with national acts mixed with local bands, giving them their biggest crowds ever.As FM radio grew more powerful in the late 1960s, KIMN’s ratings declined, and summer concerts at Elitch’s and car shows became fond remembrances. New owners cleaned out all the old disc jockeys. While KIMN never had the same clout, the station did have great moments under the eventual stewardship of general manager Steve Keeney, including the creation of the KIMN chicken, a mascot that appeared at Denver Nuggets games and other live events—everybody owned at least one KIMN chicken doll. Personalities were on the air in the 1970s and 1980s like Ed Greene, later a favorite Denver weatherman; Steve Kelley, who once sat in every seat at the old Mile High stadium; and Randy Jay.